Toronto is currently in the midst of its largest event of the year - TIFF. The hoopla it brings to the city may lead you to think the only things happening this week are TIFF related, but that's just not true (most are, but not ALL). Of course, TIFF still is the most important event we have to mention this week, so let's just get it crossed off the list now. We all love it - we know it brings a kind of life to the city that we only get to experience during these 10 days, so soak it all in. Enjoy the parties, the celeb spotting, the free stuff being handed out in rush lines - and if you can, try to actually attend a movie! The teenage songstress brings her authentic brand of pop driven angst to Echo Beach Friday night, and I couldn't be more excited. Get ready to sing Royals at the top of your lungs, on the beach, surrounded by a whole bunch of other girls (and guys) who get it. If you're wondering which party you should be at Friday night, look no further than this tribute to the late, beloved Stanley Kubrick's classic film 2001: A Space Odyssey. 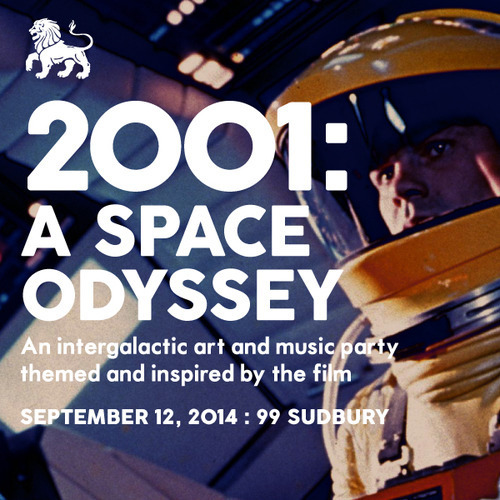 The Kubrick exhibit opens at TIFF Bell Lightbox on Halloween, so what better way to celebrate it than a 2001 themed party to cap off the festival. HAL just might take your picture while Paradise Animals play a live set inspired by the score. Oh, and LCD Soundsystem drummer Pat Mahoney will be DJing. If you've attended Young Lions previous Kubrick parties based around The Shining and A Clockwork Orange, you'll know you need to be here. Apparently this week is Craft Beer Week. I feel like Toronto has about 34 different craft beer weeks now, but any excuse to get on a boat and drink good brew is a great thing. Also, it's probably your last chance to spend some time on a boat on the lake until next summer rolls around, so jump on it. The annual art crawl takes place in everyone's favourite park over the weekend, as well as along Ossington and Queen. Spend some time outdoors in the park before it freezes up, buy some art, and support the neighborhood that Vogue just named the 2nd coolest in the world.